In April 2000 I had a bicycle accident - a motorcycle delivery guy crossed a red light and crashed into my bike. Two exposed fractures and some minor bruises. 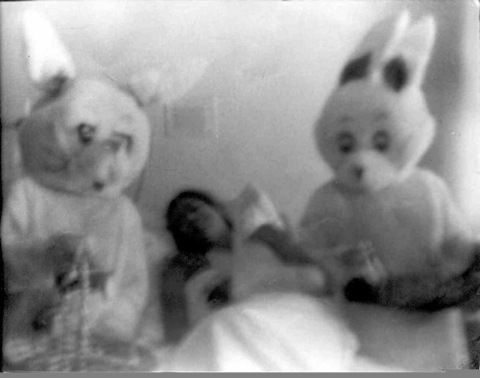 24 hours later i wake up in my hospital room all drowsy with anesthesia after-effects and these two life size rabbits, pink velour suits and giant heads are visiting. I had a film camera in my backpack at the time of the accident, so i ask my mom to take a picture because this is way too surreal. When we finally develop the film, the pic came out all blurry as the camera was damaged in the crash. Still, it is my all time favorite picture. The very moment that defined my existence, above.